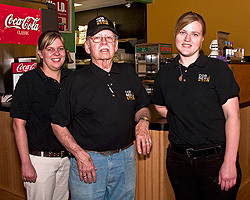 Jim Weber and Joe Leinpz opened Cornerstone Pizza & Pasta at 2 East Minnesota in March. After graduating from Sleepy Eye Public in 1979, Suzanne Kral first worked in the Army National Guard doing office work, then as a nurse’s aide, a daycare owner, and finally seven years ago as a nurse’s aide again. For three years, Andy Budahn and Matt Furth (son of former AMPI executive Mark Furth) worked side-by-side in the Twin Cities. In April 2010, the two began Prairie’s Edge Landscapes in New Ulm. Montana big sky country starts on green grassy plains before gradually flexing foothill muscles westward to reach white snow-capped Rocky Mountain highs, and swirling twinkling stars. It’s a spirit-awakening landscape only a masterful creator could artistically arrange. From this vivacious Van Gogh canvas hails soft-spoken Montanan Jerry Kauffman, president and CEO of 90-employee, New Ulm-based Windings. If it were possible to capture Lissia Laehn’s youthful energy and multi-tasking efficiency in a container, she probably would have the product available in her shop. It would be just one more service provided to her customers. Laehn (pronounced Lane) is the owner of the multi-faceted business Heartland Embroidery. I own a 100-year-old building in downtown Nicollet. It’s where I started business in 1979. Around back, there used to be a thick woody vine that may have been as old as the building itself. Our present-day world seems to have more change than a Vegas casino. President Obama and Rep. Pelosi press for paradigm-shifting change, Eyjafjallakökull coughs up clouds of it, Detroit’s mayor agonizes over change, nuclear Ahmadinejad desires more, Osama bin Laden fights for it, globalization causes it, Wall Street experiences chaos in it, and Apple enables it. Hope you’re having your fill of steamy summer weather and mosquitoes. The Editor is getting ready for an August vacation up north near Detroit Lakes. Buckle your seatbelts and away we go….